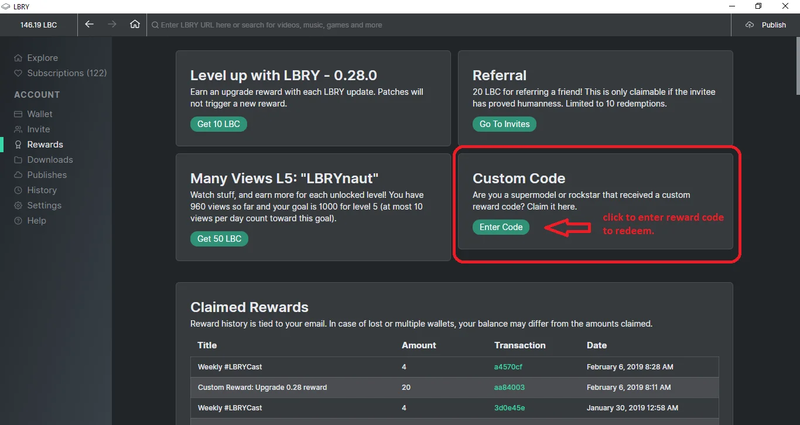 To provide a rich user experience and to distribute LBRY Credits (LBC) into the hands of new and returning users, LBRY created a Rewards system where credits are earned by completing tasks throughout the application. Rewards are given to promote application testing, learning certain in-app skills, building the LBRY economy through purchasing and publishing content, and as a small "thank you" gift for being part of a revolutionary digital media platform. For qualified users, Rewards are issued automatically by the LBRY app into each users' LBRY wallet. Note: There is a limit of 3 Reward redemptions per day. In order to be eligible for LBRY Rewards, users must have a verified account via phone number or credit card (there's also a manual verification method on Discord). If users choose not to verify themselves, LBRY works with full functionality, but they will not be able to earn any free credits from LBRY. Rewards will only be granted on a 1 account per household basis and LBRY reserves the right to revoke Rewards privileges on any account if abuse is suspected or if VPN/shared connections are used. Your First Nickel 6 LBC A one-time welcome gift for learning the basics of the application & wallet. Including the purchase of paid content. 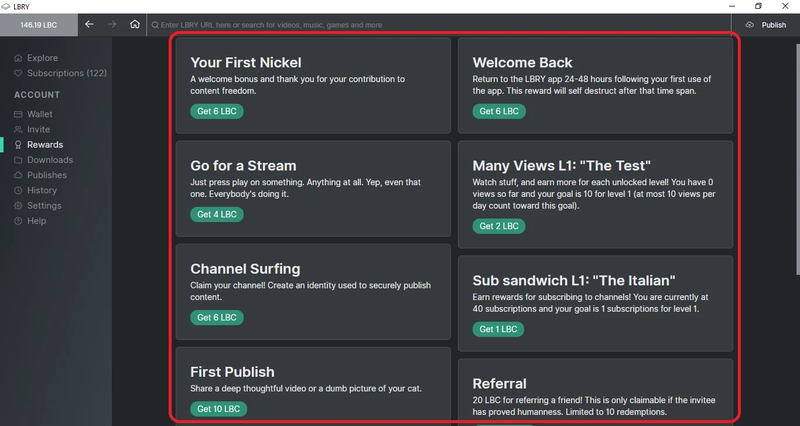 Go for a Stream 4 LBC Rewarded for streaming your very first video on LBRY. Channel Surfing 6 LBC A one-time reward for creating a channel on LBRY via the Publish screen. Many Views 2- ???? LBC A multi-level reward for watching videos on LBRY. See descriptions in-app for levels/details! Sub Sandwich 1 -2 LBC A multi-level reward for subscribing to channels. Weekly LBRYCast 10 LBC A weekly award for checking out featured content on LBRY. This content is marked with the red rocket logo and will be announced via email, recurring weekly. Welcome Back 6 LBC Return to the LBRY app 24-48 hours following your first use of the app. This reward will self-destruct after that time span. Android in Beta 20 LBC Limited time reward for early Android Beta testers. Upgrade 10 LBC Rewarded each time the LBRY app updates versions (i.e. 0.27 to 0.28). Reward Code ?? LBC Custom reward codes given out to users - be on the look out on social media/Discord/Reddit! Rewards are added to your LBC wallet balance as they are completed. All the rewards can be listed by clicking on the tab marked REWARDS inside the LBC wallet. They are also marked in the transaction history. Rewards redemption is tied to your account, but the credits themselves are stored in your local wallet file which is required to be backed up periodically. If you are new to Publishing, check out our guide. Custom reward codes can be claimed via the Rewards page in the LBRY app. You may have been given a reward code via email, social media or you stumbled upon it somewhere - whichever way, you can claim it for LBC today! It's simple, just hit Enter Code, type it in and press Redeem. If you have any questions or problems with receiving the Rewards, feel free to reach out to us.